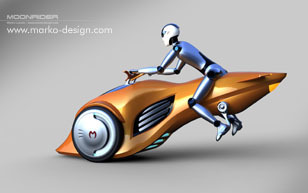 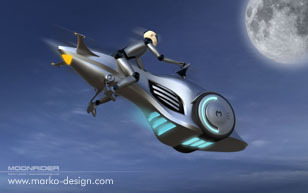 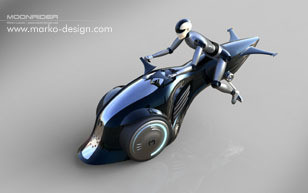 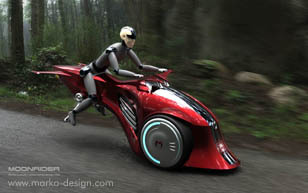 The MOONRIDER is a futuristic hybrid two wheeler which can be driven as a motorbike, but also acts as a flying machine. 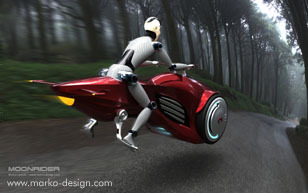 The lightweight motorcycle is an electric-powered bike with zero emission as well a plasma jet engine to provide power in flying mode. 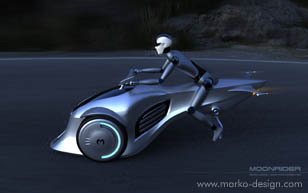 The MoonRider is made of lightweight composite materials which allows the bike to fly efficiently. 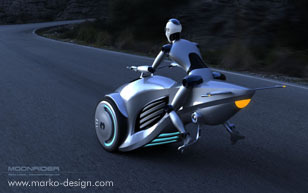 The MoonRider features two front tandem wheels that consist of electric motors powered by electric batteries. 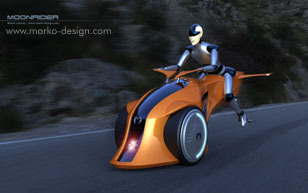 The batteries are charged up by solar panels placed in the front of the two wheeler.